In my last post, I recounted some of the issues facing tortoises around the world: habitat loss, habitat degradation, disease, hunting, etc. Some of these problems have been impacting tortoises for a long time, while others are more recent in nature. The good news is that concerned individuals have been working to support tortoise populations for a long time as well, so we’ve got some good information to utilize. And that’s a good thing, because some recent studies suggest that there are additional challenges facing tortoises. Invasive species are causing additional problems beyond the goats I had mentioned last time- in the Galapagos, for example, introduced rats eat tortoise eggs (Nelson 2007), among other things (a herpetologist friend once said that rats see tortoises as a “walking calcium source”). Fire ants here in the southeast US contribute to high mortality in hatchling gopher tortoises (Pike & Seigel 2006), and by high mortality I mean that predators, including mammals and ants, had eaten ALL hatchlings from the observed nests within 335 days of hatching- that doesn’t seem very promising for the future of that population. And researchers are beginning to understand how the underlying geology of a place can impact tortoise survival. Scientists in Spain found that soils with lots of loam and materials left behind by glaciers were more compacted and therefore harder to excavate for both burrows and egg-laying than soils with siliceous materials (Anadon et al. 2006), which means that tortoise populations restricted to those areas could face bigger challenges. Desert tortoises are also restricted by the slope of a landform (Latch et al. 2011), which means that if we place barriers like roads across the low-lying areas between two hills, we could be confining any tortoises in the middle to stay there because they won’t try climbing the hills. 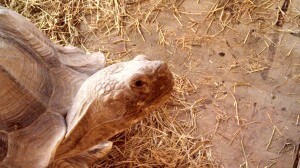 But we’re developing strategies to improve our knowledge and the survival of tortoises. Part of the answer is to ensure that tortoise populations have the habitat they need, and that means not just the space but also the plant communities and structure. Scientists investigating the impact of Upper Respiratory Tract Disease, which I mentioned last week, found that tortoises seemed to survive better in areas with lots of sites for basking (Ozgul et al. 2009), so managing habitat to create many open areas is important. A study of tortoise responses to prescribed burning to help manage habitat suggests that it’s a long-term process that will need multi-year plans (Yager et al. 2007), so it’s something that we have to really commit to. We can also help tortoises move between areas safely and have refuge from predators when they are most vulnerable. When researchers experimented with different types of road barriers to prevent highway mortality, they found that tortoises were very willing to follow fence lines and use culverts to go under the road, provided the fences had openings smaller than tortoise heads (Ruby et al. 1994). It may also be possible to improve juvenile tortoise survival by providing artificial shelters that are too small for their predators to enter (Ballouard et al. 2013). There have been some tortoise conservation success stories, which is a comforting thought. By 1965 there were only 14 Espanola Island tortoises in the Galapagos, but thanks to a captive breeding program and a goat elimination program, the species was reintroduced to the island in 1975 and is now reproducing (albeit with a very un-diverse gene pool) (Milinkovich et al. 2004). Goats have also been removed from Pinta, Santiago, and parts of Isabela islands in the Galapagos, and genetic testing of tortoises throughout the islands suggests that there are some hybrids of different species which could be used to supplement declining or even ‘extinct’ species [the suggestion is that it would take a lot of work, but there are hybrids of the Floreans tortoise on Isabela (the species had been declared extinct in the mid-1800s) which could be carefully managed to eventually produce something close to a true Florean (Parham 2008)]. Researchers are working to prioritize tortoise populations and refine conservation methods, but they still have a long way to go, especially since the over-arching turtle group has the highest proportion of threatened species of any vertebrate group according to the IUCN. I’m sure that there are ways we can contribute to tortoise conservation, something I’ll explore in my final post of the month. Anadon, JD, Gimenez, A, Martinez, M, Martinez, J, Perez, I, and MA Esteve. 2006. Factors determining the distribution of the spur-thighed tortoise Testudo graeca in south-east Spain: a hierarchical approach. Ecography 29: 339-346. Ballouard, J-M, Caron, S, Lafon, T, Servant, L, Devaux, B, and X Bonnet. 2013. Fibrocement slabs as useful tools to monitor juvenile reptiles: a study in a tortoise species. Amphibia-Reptilia 34: 1-10. Latch, EK, Boarman, WI, Walde, A, and RC Fleischer. 2011. Fine-scale analysis reveals cryptic landscape genetic structure in desert tortoises. PLoS ONE 6: e27794. Milinkovitch, MC, Monteyne, D, Gibbs, JP, Fritts, TH, Tapia, W, Snell, HL, Tiedemann, R, Caccone, A, and JR Powell. 2004. Genetic analysis of a successful repatriation programme: giant Galapagos tortoises. Proceedings: Biological Sciences 271: 341-345. Nelson, B. 2007. Tortoise genes and island beings: giant Galapagos reptiles on the slow road to recovery. Science News 172: 298-300. Parham, JF. 2008. Rediscovery of an “extinct” Galapagos tortoise. PNAS 105: 15227-15228. Pike, DA and RA Seigel. 2006. Variation in hatchling tortoise survivorship at three geographic localities. Herpetologica 62: 125-131. Ozgul, A, Oli, MK, Bolker, BM, and C Perez-Heydrich. 2009. Upper Respiratory Tract Disease, force of infection, and effects on survival of gopher tortoises. Ecological Applications 19: 786-798. Ruby, DE, Spotila, JR, Martin, SK, and SJ Kemp. 1994. Behavioral responses to barriers by desert tortoises: implications for wildlife management. Herpetological Monographs 8: 144-160. Yager, LY, Hinderliter, MG, Heise, CD, and DM Epperson. 2007. Gopher tortoise response to habitat management by prescribed burning. The Journal of Wildlife Management 71: 428-434.